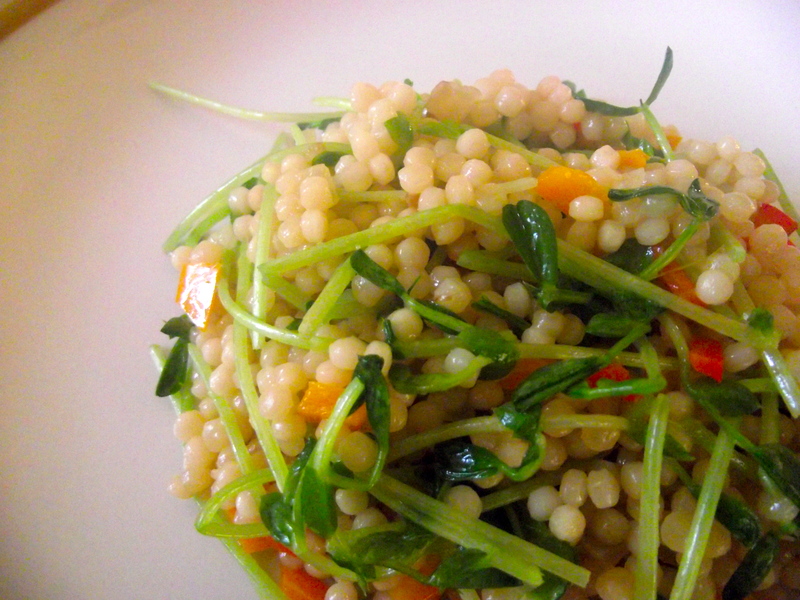 I put pea shoots in my cous cous, cous I felt like it. First, I have to say, the baby pea shoots absolutely make the dish. I love the crunch and freshness it adds to the savory flavors from the chicken broth and sauteed onions. I love spring, and I loove spring veggies even more. Today was a gorgeous, sunny, 65 degrees Sunday. Siiiigh. I could live in this kind of weather forever. And cook this kind of food forever. 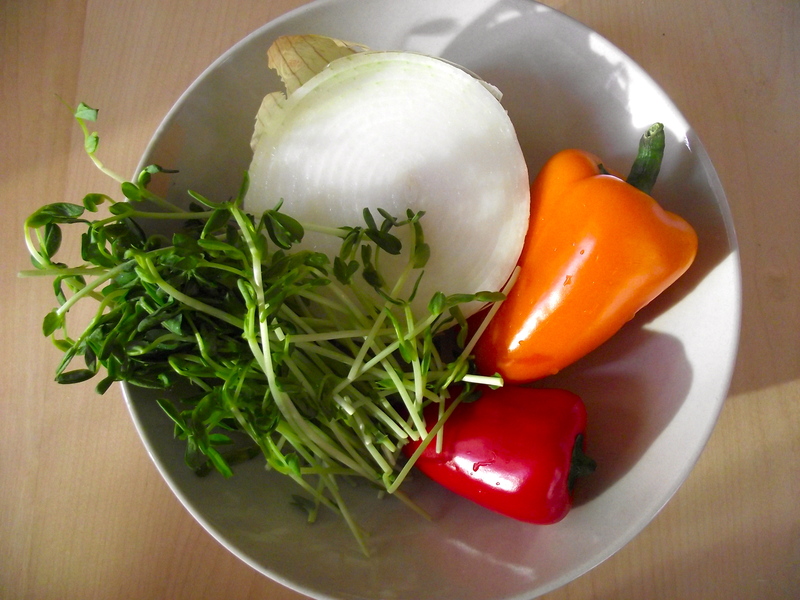 I bought a few of the baby bell peppers from Trader Joe’s as well…heck, everything in this recipe is from there. I made a list. I went to town. It happens. I prefer red and orange bell pepper over green because I feel they’re a bit sweeter and milder than the green kinds. I used about 1/2 – 1 cup diced. Step 1. 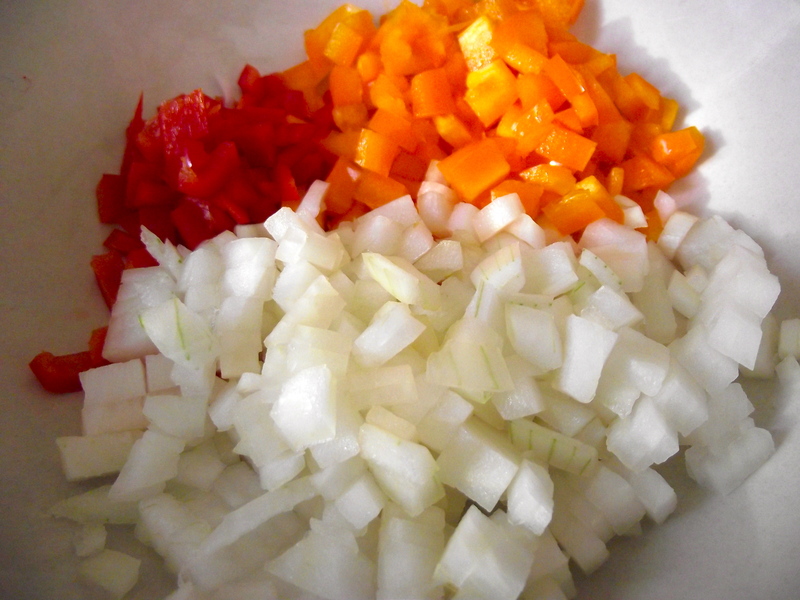 In a sautee pan, heat some veggie oil on medium then get to dicing the onion and bell peppers. Step 2. When oil is heated, sautee the onions until caramel, wilted and see-through. I always love this part. Step 3. Keeping the heat on medium, add the cous cous and fry it with the onions for about 2-3 minutes then add the chicken stock. Crank the heat to high until it starts boiling then lower the heat back down to low. 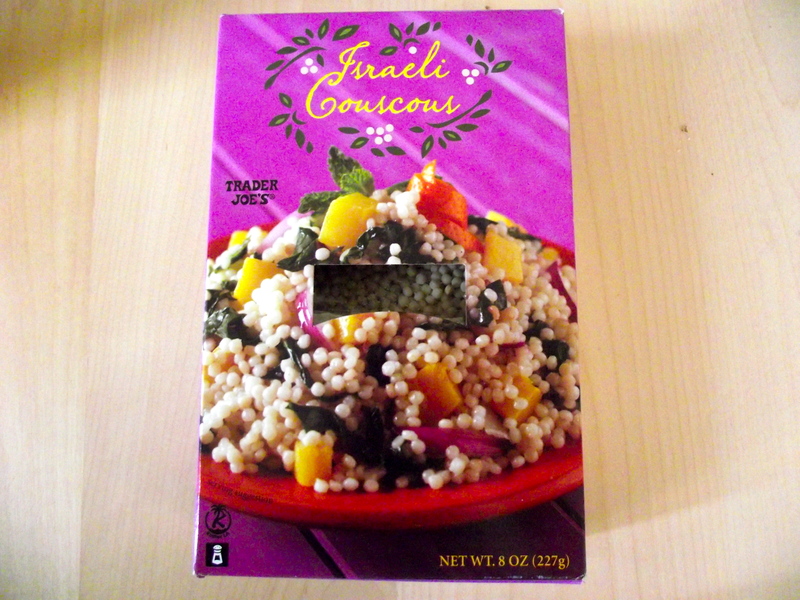 Put a lid on it and wait about 15-20 minutes until the cous cous has softened and absorbed all the flavored goodness. Step 4. 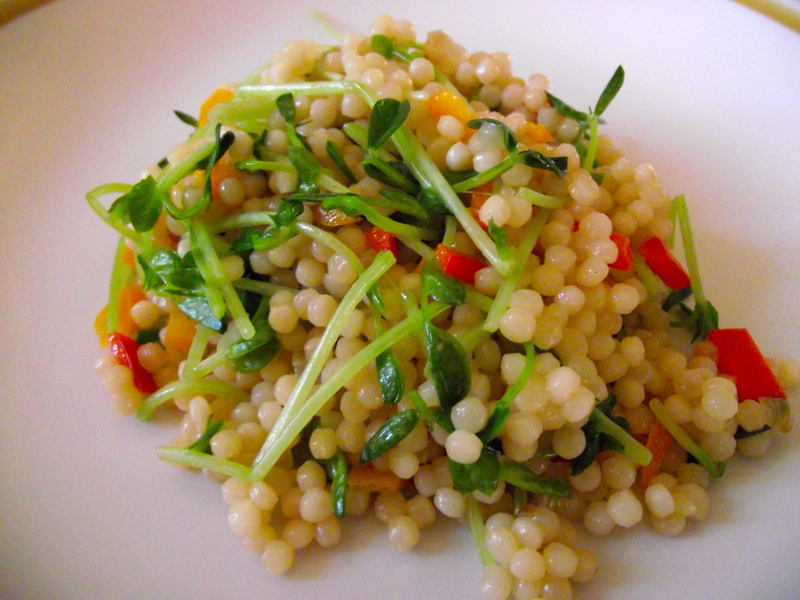 During the last 5 minutes of cous cous cooking time, add the diced peppers directly on top of the cous cous. DO NOT mix. The steam will cook these babies up fine. Replace the lid back on the pan until the 15-20 minutes cook time for the cous cous is up. Step 5. Then, keeping the heat on low, mix the cous cous and taste. Add salt if needed. Add a bit of pepper. Step 6. 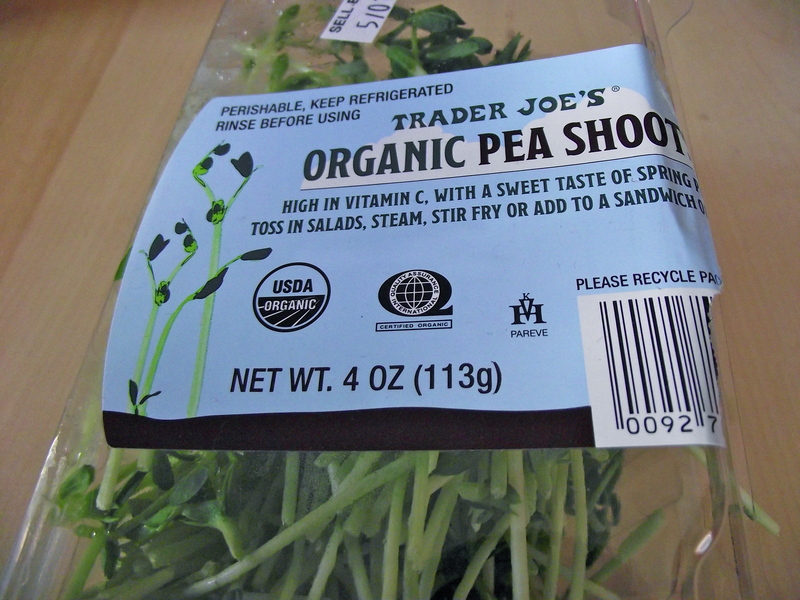 Turn off the heat and add the baby pea shoots. Here’s a pic of the kind I got. Deeelicious. I love putting these on top of my soups, in between sandwiches.. fried rice.. oh.my.goodness.good. Step 7. Serve! Yes. It’s that simple. I had this for dinner tonight with salmon but it would taste just as heavenly with grilled chicken, a side salad, or heck, all by itself. Enjoy!